Well, I’m a couple of years late boarding the carb alternatives train, partly because carbs bring me joy on a daily basis and I’ve never felt the need to be deprived of them. Also, I won’t allow myself to buy anymore cooking gadgets for the sake of our tiny, crammed galley kitchen, despite the distinct urge to buy a spiraliser when they were last year’s go-to bit of kit. However, my lovely soon-to-be in-laws got me a mandolin for my birthday so I thought I’d have a go at making courgetti. Courgetti, as I’m sure many of you will know, is a healthy and green alternative to spaghetti. By slicing a courgette into thin strips using a mandolin and then slicing them again with a knife into finer strips, you can achieve a similar shape to spaghetti. You can of course also use a spiraliser which may be even simpler. Courgetti is very low in calories. You feel a bit smug and virtuous while eating it. And, surprisingly, it did fill me up. I think it’s a psychological thing, but after finishing this dish, despite it being very tasty, I instantly felt unsatisfied. This is probably because I’ve got a big appetite and am used to shovelling a vat-full of pasta into my mouth. However, after waiting for 20 minutes or so, while the little courgette worms started to make their way through my digestive system I did begin to feel full up. So if you’re a bit reluctant like I was, give it a go. I’ll definitely be making it again. I was inspired to make pesto while flicking through Anna Jones’ A Modern Way to Cook book. She suggested using pistachios in her version, but I didn’t have any in, so I opted for cashews instead. The combination of the crunchy cashews with the zesty lemon, the rich sour cream and pungent basil works really well and reminds me of summer. This meal is a great mid-week option as you can have it ready within 20 minutes AND because it’s got so much goodness in it, you can balance it out with a tasty dessert. 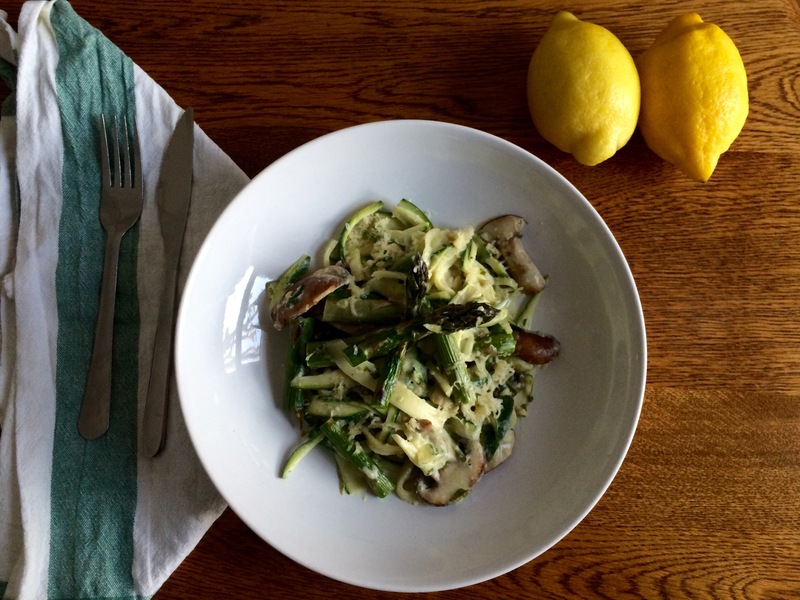 I just happened to pair the courgetti with vegetables I had in the fridge, but you could swap asparagus for crunchy mangetout or green beans and perhaps some butter beans instead of mushrooms to achieve that lovely earthy texture. Finely slice the courgette using a mandolin. Pile up your courgette slices on a chopping board and thinly slice them lengthways. Set them aside in a bowl. Prepare the pesto. If you have a food processor, put all of the pesto ingredients – except for the sour cream – into the processor and whizz them up until mostly smooth. Don’t worry if it’s not entirely smooth, it’s nice to have a little bit of crunch. If, like me, you don’t have a food processor, do the same but chop the cashew nuts up with a knife as small as you can first, then use a measuring jug to put the ingredients into and whizz them up with a hand whisk. When you’ve got a paste, mix in the sour cream. Put the grill on a high heat and place the asparagus spears under the grill for 5-1o minutes, or until they have softened. Put a frying pan on to a medium high heat and pour in the sunflower oil. Fry the mushrooms for five or so minutes, until they begin to soften. Meanwhile, boil the kettle. Pour boiled water over the courgette slices and leave for 30 seconds to a minute, then drain. Add the courgetti to the pan and reduce the heat. Stir in the creamy sauce and take off the heat. When the asparagus has softened, remove it from the grill. Chop the spears in three and add to the pan. Stir all of the ingredients in well together and season well. Serve in a pasta bowl topped with some finely grated cheese.